Johann Pachelbel (1653-1706) was born and died in Nuremberg. His parents enrolled him in St Lorenz High School, and he received his early musical training from the two leading local instructors, Heinrich Schwemmer, who taught him the rudiments of music, and G. C. Wecker, who taught him composition and instrumental performance. To enhance his general education he attended the Auditorium Aegidianum, where sons of the city's cultured families listened to learned lectures. On June 29th, 1669 he entered the University at Altdorf, where he also served as Organist of the Lorenzkirche. Because his father could not afford to support him, he was forced to leave the University after less than a year. Probably in the Spring of 1670 he enrolled in the Gymnasium Poeticum at Regensburg, where his exceptional academic qualifications were rewarded with a special scholarship over and above the school's normal quota. He was also permitted to study music outside the gymnasium under Kaspar Prentz, a protégé of J. K. Kerll. It was probably under Prentz that he studied the music of leading Italian composers. On May 4th, 1677 he became Court Organist at Eisenach, under the Capellmeister Daniel Eberlin, in the employ of Prince Johann Georg, Duke of Saxe-Eisenach. 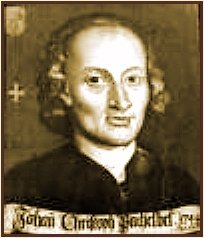 After about a year, though Pachelbel had no offer of employment elsewhere, he requested and received from Eberlin a gracious testimonial in which Eberlin described him as a 'perfect and rare virtuoso'. He left Eisenach on May 18th, 1678. Perhaps by good luck, but more probably by pre-arrangement, Pachelbel found almost immediate re-employment as Organist of the Protestant Predigekirche at Erfurt. His contract, dated June 19th, 1678 just a month later, clearly prescribed, among other details, the Organist's role. He was to precede the singing of a chorale by the congregation with a thematic prelude based on its melody, and he was to accompany the singing throughout all the stanzas. In a further attempt to reign in any tendency of unpredictable behavior on the part of the Organist, Pachelbel's contract makes it clear that he was not to improvise the Prelude but should diligently prepare it beforehand. It was also specified that every year on St John the Baptist's Day, June 24th, , he was to observe the anniversary of his employment by submitting to a re-examination, and by demonstrating his vocational progress during the past year in a half-hour recital at the end of the afternoon service, using the entire resources of the organ in "delightful and euphonious harmony". On August 24th, 1684 he married Judith Drommer (Trummert), who bore him five sons and two daughters. During his years in Thuringia at Eisenach and Erfurt he was naturally drawn to the Bach family. Ambrosius, Johann Sebastian's father, asked him to act as godfather to his daughter Johanna Juditha and to teach music to his son Johann Christoph, later known as the Ohrdruf Bach, and the teacher of Johann Sebastian. Pachelbel was outstandingly successful as organist, composer, and teacher at Erfurt, but he eventually asked for permission to leave and was formally released on August 15th, 1690 after twelve years' service. From September 1st, he was musician and Organist at the Wurttemburg Court at Stuttgart under the patronage of Duchess Magdalena Sibylla. His new position was in many respects an improvement for him, but in the autumn of 1692 he was forced to flee before a French invasion. He went to Nuremberg but within a few weeks returned to Thuringia, where on the 8th of November he became Town Organist at Gotha. According to Mattheson he was invited on December 2nd, 1692 by a distinguished gentleman to fill an organist's post at Oxford but declined the offer. He also refused a request to return to Stuttgart. Following the death on April 20th, 1695 of Wecker, Organist of St Sebaldus Church, Nuremberg, the authorities appeared anxious to appoint Pachelbel, a celebrated native of the city, for contrary to the usual practice, the position at St Sebaldus, the most important position of its kind in Nuremberg, was not filled by examination, nor were the Organists of the city's lesser churches invited to apply. After Pachelbel had officially received an invitation from St Sebaldus, he addressed a gracious letter to the authorities at Gotha asking them to release him. He presumably arrived at Nuremberg during the Summer, for on July 26th, 1695 the city council ordered that he be paid 30 gulden towards his traveling expenses. He remained at St Sebaldus until his death, eleven years later. As at Erfurt, he was soon surrounded by many pupils who eventually assumed positions of importance, and three of his four children followed him into musical careers: Wilhelm Hieronymus (1686-1764), much his father's most promising pupil, became Organist at the Sebalduskirche (after J.C. Richter) and a composer of keyboard music; Carl Theodor (1690-1750), also an organist and composer, emigrated to North America when he was about 40 years of age, and worked on the East coast in Boston, Newport, New York and Charleston; Johann Michael (born 1692) was an instrument maker. Though a busy organist throughout his working life, Pachelbel was a remarkably prolific composer. He wrote for the organ, harpsichord, chamber ensembles and various vocal media. He composed his liturgical organ music for the Lutheran ritual. The Organ Chorales met specified requirements in his contract with the Predigerkirche, Erfurt, and the Magnificat fugues served to enhance Vespers at St Sebaldus, Nuremberg. In his organ music he also cultivated the non-liturgical genres of toccata, prelude, ricercare, fantasia, fugue and ciaccona (chaconne). His other keyboard music consists of fugues, suites and sets of variations. He made modest contributions to chamber music. His preference for composing in a lucid, uncomplicated style found its fullest expression in his vocal music, which must have engaged much of his attention. His earliest datable works are two arias of 1679. The works with Latin text probably date from the last decade of his life, when he was at Nuremberg.